The Diamond Head State Monument Deluxe Tours is one of the most popular packages purchased at the Diamond Head Visitor Center. Your pay-$19.95, save $15.00 each tour. The Diamond Head hike takes about 2 hours; is considered a “moderate” 1.6 mile hike, with 327 concrete and metal stairs to conquer. It’s not considered an easy hike, but it is extremely scenic and fun hike to the summit. 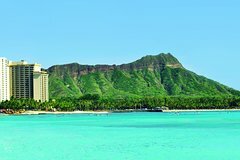 Diamond Head crater is just minutes from Waikiki. Our incredible self–guided audio tour comes with a four color souvenir map guide and focuses on the history, legends, culture, geography, plant & animal life, music and scenery of the Diamond Head State Monument. Learn how the ancient Hawaii’s considered Diamond Head a sacred location and how the US Military used Diamond Head for their first line of defense on protecting Oahu southern shores during World War II. Your pay-$19.95, saves $15.00 each tour. • Diamond Head Visitor Center is 365 days a year from 7am to 3:30pm, last tour at 2 pm. • Check in at the Diamond Head Visitor Center with your tour confirmation, the only location in Hawaii that offers the State of Hawaii exclusive Diamond Head logo merchandise.